Hey everybody! Welcome back to “Brewers By the (Jersey) Numbers”, my annual time-passing countdown to Brewers Opening Day by way of profiling players who wear a uniform with a number that matches how many days it is until said Opening Day. That a 6’2″, 190 lb right-handed pitcher from Hollywood, Florida via Deerfield Beach High School, Nova Southeastern University, and the 22nd round of the 2009 First-Year Player Draft would make the majors is a longshot. That he’s excelled at the highest level of competitive baseball despite being undervalued by many, overlooked by most, and dismissed by all but a few is remarkable. But that’s not necessarily the way Michael Bruce Fiers would tell it. Oh, he’s overcome an incredible set of odds just to etch his name into the big scorebook at all if nothing else was a problem, but Fiers has a well-documented story of getting past injury, personal tragedy, and a pitching profile that caused so many prospect evaluators to not bother profiling Fiers at all. I won’t get into it all here, but if you search “Mike Fiers BBtJN” over in the search bar on the right, you’ll find some of it that you might not have known. But just looking at his skills as a pitcher, Fiers had a questionable ceiling to say the least in the eyes of most scouts. His fastball sat upper 80s (89.5 average velocity in 2014 according to FanGraphs.com) to low 90s and none of his other offerings were really considered to be “plus”. He brings a curve, changeup and cutter now which have helped him have staying power, but the phrase “working off of his fastball” holds very true for Fiers. It’s his pinpoint control and command that is most noticeable when Fiers is on his game. I believe it was Greg Maddux who once said that he learned by taking some MPH off of his fastball, he could put it wherever he wanted whenever he wanted to, including getting more movement on it. Now, Mike Fiers is no Greg Maddux but the philosophy can be applied to others. Fiers hits the corners and throws all of his off-speed pitches for strikes. That combination allows him to elevate his fast ball out of the zone and get a plethora of swings and misses as guys are expecting the fastball to catch the zone or perhaps that Fiers is spinning a change up or a curve ball that’ll drop into the zone if they don’t swing. But these are big league hitters, you say. Why don’t they just recognize the pitch better, you ask. Well, that’s where the deception in Fiers’ delivery comes in extremely handy. He hides the ball incredibly well and hitters don’t get much of a look at it late in his motion. Every fraction of a second later adds up to big losses in reaction time for a hitter, yes even big league ones. Every year is the same song for Fiers though. He pitched well in the minors on his way to being on the radar at Triple-A (his 2011 season was fantastic, incidentally) but he had a rougher go in 2012 and 2013 in the minors. Some of that was injuries, some of that was no doubt mental as his priorities were rightfully off the field at times. While 2012 may have been the coming out party for Fiers, it was 2014 that really showed what a physically and mentally healthy Mike Fiers is capable of. He stymied hitters over and over. His minor league season (17 starts) completed with a 2.56 ERA in 102.0 innings pitched. He tallied 129 strikeouts and led minor league baseball in strikeouts for a few weeks after getting the call back to The Show. He didn’t miss a beat once back in Milwaukee. In 14 games (10 starts), Fiers would pitch to a 2.13 ERA in 71.2 innings, with 76 strikeouts. One of his most fun to watch and most dominant starts of 2014 came on August 14 against the Chicago Cubs. Fiers would strike out 14 baby bears that day in just 6.0 scoreless innings. At the far other end of the spectrum was Fiers’ game on September 11 in Milwaukee. In a wildly uncharacteristic moment, Fiers lost a fastball that would hit Marlins superstar Giancarlo Stanton in the face. Fiers was visibly shaken and only finished the inning after an ugly brawl broke out due to some miscommunication following a pitch to replacement hitter Reed Johnson. The details needn’t be relisted here, but if you want to read about it because you somehow missed it, there are plenty of accounts of it. I even archived Fiers’ entire postgame availability on my Instagram account (@brewer_nation). Afterward, there was a lot of talk about whether Fiers would even make his next start, let alone how he would pitch in it. Showing the kind of mental fortitude he’d built up over the years, Fiers would not only make the rest of his starts last season, but he’d pitch pretty doggone well (18.0 IP, 6 ER, 13 K, 4 BB), especially factoring in the circumstances. But Fiers was truly at his best in August, during a stretch of time when both Kyle Lohse and Matt Garza were on the shelf with injuries. The team desperately needed someone to rise to the occasion, and Fiers answered the bell. 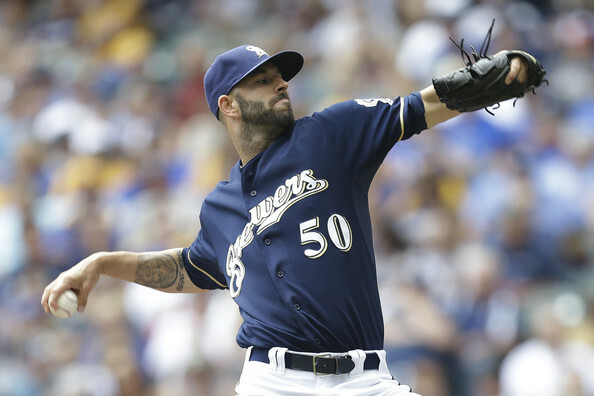 In the oldest sense of the word, Fiers has proven to be a bulldog for the Brewers. He wants the ball, he takes the ball, and he baffles hitters with good old fashioned swing-and-miss stuff. He doesn’t blow it by you with speed, but it still gets past you consistently. That’s a true artist. Fiers finally enters a season with a job waiting for him in a big league rotation. In fact, he’s the #4 as things stand today, meaning that even if Yovani Gallardo hadn’t been traded, Fiers still would have had a job. He’s proven capable. He’s proven dependable. Now he has a chance to prove consistency over an entire Major League season, one where teams see him multiple times and there will be no more excuses for the doubters to look to. As a 29-year-old, it’s time for Fiers to show it all off from the jump. It could truly be an incredible season if it all comes together. Following Saturday’s game, the Brewers announced that they had place right-handed relief pitcher Tyler Thornburg on the 15-day Disabled List. The official cause for the designation was termed as “elbow soreness”. Before the game, manager Ron Roenicke said that it was something that had been there for a little while. That would explain both Thornburg’s limited use lately and lack of effectiveness with Friday’s game as the most glaring example. 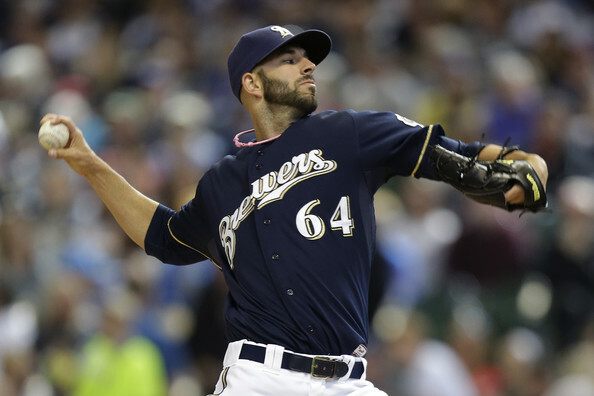 In his place, the Brewers have recalled right-hander Mike Fiers. Fiers dazzled for much of 2012 both as a starting pitcher and a reliever before a late season swoon chalked up mostly to workload concerns. 2013 got off to a rough start as Fiers dealt with off-field distractions and was eventually lost almost entirely to injury. I have to point out a couple of things again for you. I know it’s the Pacific Coast League and not the National League, but these are the kinds of encouraging numbers that belie that Fiers’ command and control are with him this season. Welcome back to The Show, Mike! It’s January 26th. 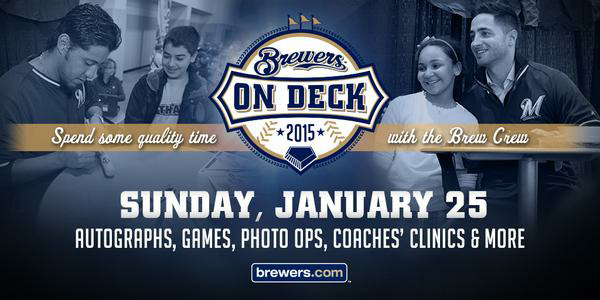 We are 64 days away from Opening Day at Miller Park on March 31st. To describe the year that Mike Fiers had in 2013 takes more than just a simple look at his final numbers. The numbers were bad but his fortunes were worse. Fiers was coming off of a 2012 season in which he burst onto the scene for 22 starts and a 3.74 ERA. It was a season that saw him post a 1.261 WHIP and 135 strikeouts in 127.2 innings pitched. Those and other numbers were there despite a late season swoon which many people hoped was simply as a result of fatigue. Unfortunately, Fiers began his season with a rough start. Lasting just 5.0 innings and allowing six earned runs on nine hits (including two home runs) and one walk, it set the stage for a hard upcoming year. The control-reliant righty would make just three starts at the big league level in 2013 to go along with eight relief appearances. They were spread out though. Fiers pitched in three games in April and then was demoted to Class-AAA Nashville on April 18th. He was then reassigned from Nashville to Class-A Advanced Brevard County which led to a lot of speculation as to his future with the ballclub. As it turned out, Fiers requested the move to Brevard because it’s in Florida and far closer to his sick mother than Nashville was. And that’s where the most real bad fortune of Fiers’ season was centralized. I’ll refer you to this article by Adam McCalvy if you want to read more. But, Fiers still had a job to do. And when Tom Gorzelanny hit the disabled list in May, Fiers was recalled. He would make the rest of his MLB appearances for the year before being sent back to Nashville on June 3rd. In June, specifically on June 15th, Fiers would break his forearm when he took a line drive off of it during a game. He was scheduled to miss significant time. Some birthday present. Perhaps though, in some way, the injury was a blessing in disguise. Fiers was able to rehab near home and as a result was able to be with his mother when she passed away in August. Fiers dealt with more adversity on a personal and professional level in five months than most players deal with in a career. Still, he remains on the 40-man roster of the Brewers as he’s certainly demonstrated the ability to contribute at the big league level. He’ll be in camp with just as much chance to make the roster as anyone else. In a world where too many athletes get their story of overcoming adversity written, when and if Fiers returns to the big leagues it will certainly be a much more appropriate use of the phrasing.